The art show opening will take place on 14th of February 2014, starting 8 pm. - After-party till last customer. The show can be visited between February 10th to February 15th 2014. Frumusețea unei piei în contrast cu altă piele (The beauty of a skin in contrast to other skin) is a mixed media documentary about the state of the contemporary society and the way it touches our day-to-day life. The exhibition includes 9 paintings by Cristiana Negoescu, each of them being completed by text and mixed media installations, made by Ioana Cristina Casapu. The show also includes five other mixed media art works Cristina have exhibited in November 2013 at the Palace of Parliament and the the video Overlapping Memories, produced by the artist in 2013, to be screened during the concert (OANA+ŞTEFAN from Poetrip). Ioana Cristina Casapu (27) is a journalist and creative director in photography, fashion and art projects. Cristiana Negoescu (23) had her first art show in 2005, when she was only 15 and several exhibitions in Bucharest ever since. Ioana and Cristiana became friends in Control, while one was drinking tea and the other wine. They don’t have much in common, and this is exactly the drive of their relationship. 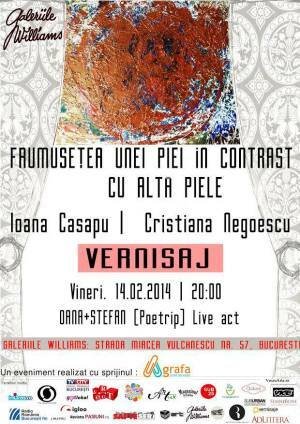 "The beauty of a skin in contrast to other skin" Art Show in Bucharest. You can get here description, reviews, address, time and details of "The beauty of a skin in contrast to other skin" Art Show in Bucharest. Visit Bucharest Tips for more Art Show events in Bucharest!